Fourth Row Center: Film Writings by Jason Bailey: Cassavetes: "Husbands"
John Cassavetes is a filmmaker I know quite a bit about, considering how little of his work I’ve seen. His seminal 1959 indie Shadows was on my viewing list in the run-up to what became a three-day stint at NYU film school (long story, don’t ask) back in 2001; I caught his second film, Faces, at a Museum of Modern Art screening last year. But at a rate of one film every seven years, it’ll take me quite a while to work my way through his filmography, so I figured I’d ramp it up (particularly considering how my interest in him amped up after reading the excellent biography Accidental Genius a while back). So I’m going to take on the rest of the Cassavetes oeuvre over the next few weeks, starting with the third “real” Cassavetes movie (he made a pair of studio pictures, Too Late Blues and A Child Is Waiting, between Shadows and Faces, but they’re considered by most to be compromised and diluted, and besides that, they’re hard to track down). After the sleeper success of Faces, Cassavetes made Husbands, a free-wheeling, two-hour-plus midlife-crisis drama, heavy on improvisation and naturalism. 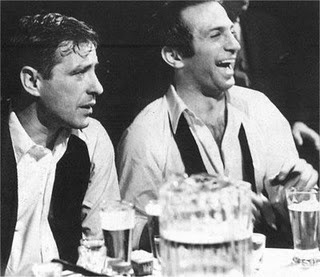 He also put himself in a major role for the first time (his success as an actor in hits like Rosemary’s Baby and The Dirty Dozen had made him a bankable asset), co-starring with Peter Falk and Ben Gazzara as a trio of successful suburban professionals who go on a multi-day binge of drinking and bad behavior in New York City and London following the death of a close friend. There’s a simplicity to the raw, unvarnished truth of that scene that makes you understand, with absolute clarity, why he was so revolutionary, and why his name is still spoken in reverential tones by indie filmmakers. Few directors have ever been so overstated yet understated, so decadent yet restrained. His films are frustrating. But there are these amazing things inside them, and the final sequence of Husbands is, in its own way, kind of shattering. This film, like many of his others, offers much—to those who have the patience for it.